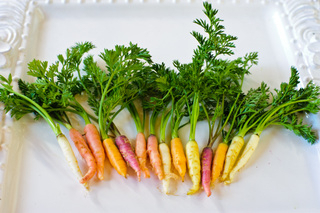 Crunchy, sweet garnish with fantastic flavor; TinyVeggies™ Carrots are 1/2" in length with leaves attached; Eat fresh or cooked; Steam, Saute, Bake, Enjoy! Tiny Veggies™ Carrots are harvested by hand at a very young age. Versatile and easy to use.